how the children from Narnia coped with adulthood? what it's like to voyage into a black hole? why dystopias rise, and fall? who protects your home when you're not looking? what heroes talk about on the eve of a decisive battle? what happens in your village, when your heroes are away? Seven Wonder has the answers! 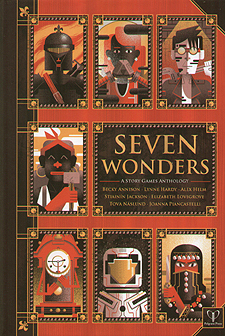 Seven Wonders is a collection of stand-alone, collaborative storytelling games from UK-based games designers, which focuses on thoughtful characterisation and inter-character drama, and uses improvisational acting techniques to tell innovative, compelling tales. Requiring only a pen, paper, and friends to play, these games are easy to learn - if you can tell stories, you already know how to play. Seven Wonders explores a range of themes and settings, from fantasy and science fiction, to modern-day group therapy, and nightmare dystopian futures.